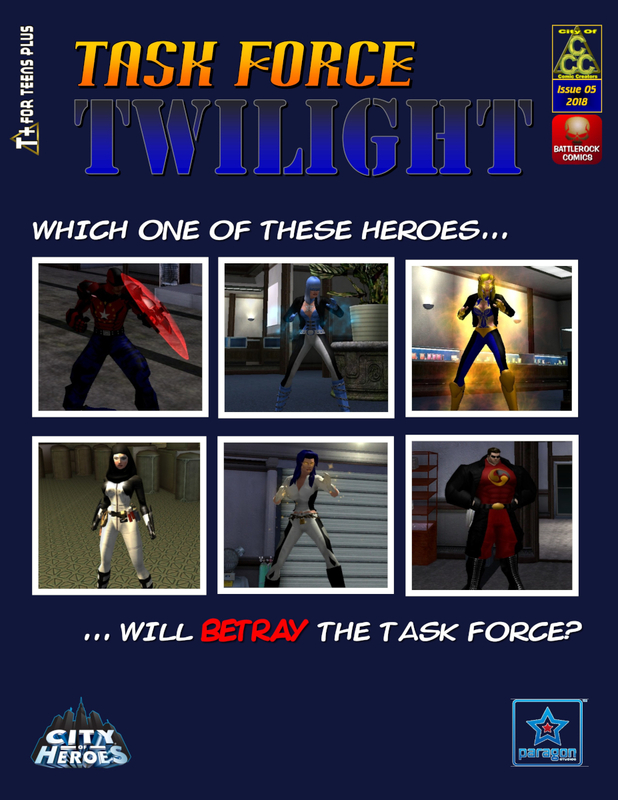 Task Force Twilight 05 Is Now Online! With Cardinal Syn and her Task Force hindering the efforts of the corrupt police officers of the Blue Dog Squad, things are starting to escalate. Political pressure is brought in. A certain controversial person is back in action. And now it starts to get personal for our heroes. Who will be the one that will end up betraying the Task Force? Find out! He’s a man of mystery that has the Paragon City police nervous. According to creator David 2, Sundown has a connection to the original investigation of the corrupt Blue Dog Squad. Indeed, in the classic one-shot “Guardians of the Dawn 2012 Special”, we learn that both future Guardians were going after the original Blue Dogs their own ways. David 2 also said that the character the name Sundown was inspired by the Gordon Lightfoot folk song with the same name. 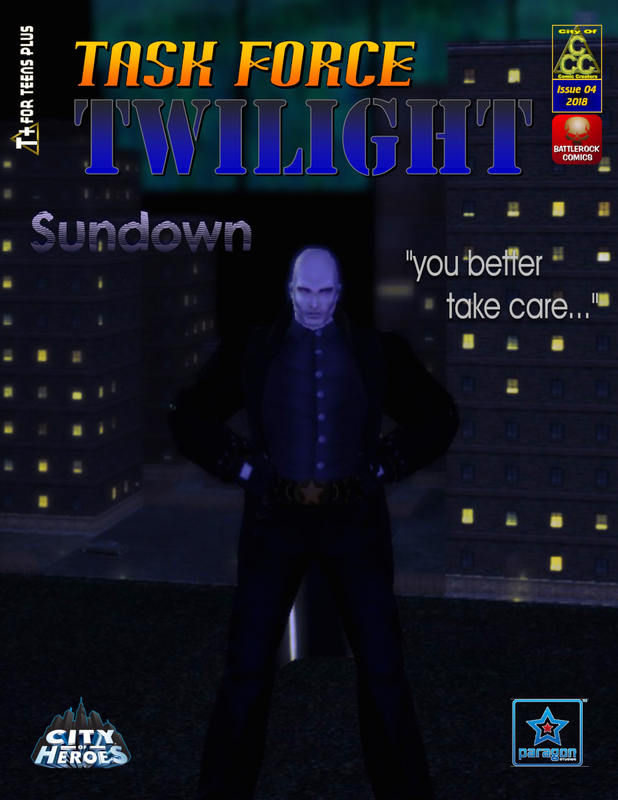 You can find out more about who – and what – Sundown is when “Task Force Twilight” #4 goes online on June 29th. It was fourteen years ago on this day that the first-ever superhero-themed massive multiplayer online role-playing game was launched. “City of Heroes” was a unique online experience, allowing players to create their own superheros from a variety of archetypes, powers, and costumes. The sheer amount of customization set the game apart from all others, in addition to its superhero theme and setting. Set in the fictional city of Paragon City, Rhode Island, “City of Heroes” allowed players to begin a career as a superhero amidst a city still recovering from a devastating extra-dimensional invasion that fragmented the city into several zones surrounded by massive walls. (The kind of walls that Donald Trump wishes he could have.) As you progress in your “career” as a registered hero, you gain new powers, including special abilities like being able to fly or run at super-speed or leap extraordinary distances. As the game developed over the years, the level of customization became legendary. With the launch of “City of Villains” in 2005, players could become villains and begin their own criminal careers in a system that mirrored – and later merged with – “City of Heroes”. This system also allowed players in both systems to join together to create superhero or supervillain groups and design their own headquarters. In 2009, “Mission Architect” allowed players to create their own adventures, including their own custom characters, that they could then publish and have other players take part in and critique. A year later, “City of Heroes: Going Rogue” joined “City of Heroes” as an expansion pack that not only introduced players to a completely new universe, but also allowed players to change alignments, going from heroes to villains and vice-versa. Sadly, for reasons that still cannot be truly explained, the parent company of “City of Heroes” made the abrupt decision to terminate the game. Despite months of pleading with corporate officials and endless protests, the MMORPG shut down just after midnight on December 1st, 2012. There are clearly other MMO games online. “Champions Online” is now the longest-running MMO, designed with features the original developers could not bring into “City of Heroes”. “DC Universe Online” is the first cross-platform MMO, being accessible through both PC and game consoles, and using legendary characters and settings in the world of DC Comics. However, when people think superhero MMOs, they still think “City of Heroes”. Although the game servers are shut down, “The City” is still remembered not only through the numerous developers that are trying to create “spiritual successors”, but also through talented people like the City of Comic Creators, who keep the stories going through the downloaded software and an MMO process called demo-recording. At Battlerock Comics, we salute the developers and the thousand of players of that game that was first online in Paragon City fourteen years ago. Without them, Battlerock Comics itself would not exist today. In a city full of superheroes, sometimes the tribulations of one can go ignored. Martin Keys, the once-and-former Street Justice, was one such hero. A friend of Galatea Powers, Martin earned the respect of the other members of the Guardians of the Dawn when he answered the call for help during the “Time and Changes” story in “Guardians of the Dawn Spotlight”. He even carried the shield that was originally supposed to go to Captain Paragonna. Sadly, Street Justice was one of thousands who were in Galaxy City when it was devastated in a Shivan meteor shower. Although presumed dead, he and over 2000 others were saved through the efforts of his fellow Guardians. But his time away was not easy for him or the other “lost” heroes. His one-time girlfriend was critically injured by a teammate during an accident. Enraged, Martin went after the one he blamed for the accident, only to end up losing both his arms to frostbite. Since then, Martin has struggled with trying to adapt with new cybernetic arms. As we will learn in “Task Force Twilight” #3, the loss of his human limbs has not only sidelined him as a hero, but it also affected him as a tailor. “Task Force Twilight” #3 goes online on March 30th.